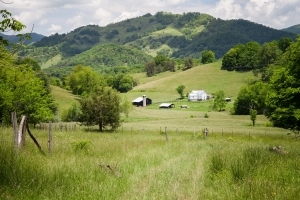 Hugged by mountains and tucked away in the scenic Crabtree community of Haywood County, Rogers Cove contains beautiful rolling pastures and forested hills that stir the imagination. We have permanently protected 385 acres of productive, scenic farmland in this cove through agricultural conservation easements. 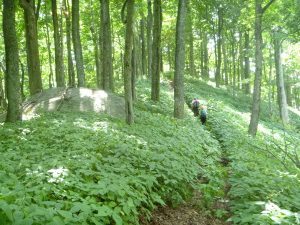 Highly visible from scenic drives along Crabtree Mountain Rd and Upper Crabtree Road, as well as from hikes on Crabtree Bald, conserved land in this picturesque cove is made up of multiple adjoining tracts owned by members of the Rogers family. The family has farmed this cove for more than 150 years. 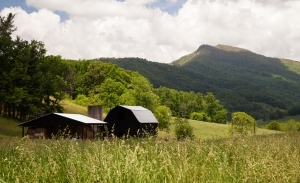 The Rogers Cove properties include a mixture of high elevation cattle grazing pasture and prime agricultural bottomlands, and both the Mark Rogers and the Terry & Fran Rogers properties have been designated as Century Farms by the state of NC. Family members Edwin & Lucene (Cenie) Rogers, Mark & Laura Rogers, and Terry & Fran Rogers worked together with us to protect their adjoining properties. Sadly, Edwin passed away in 2017, before he saw completion of this effort; we are deeply grateful that the family was able to continue working with SAHC to permanently protect the land. Edwin Rogers, who was designated a River Friendly Farmer by the Haywood County Soil & Water Conservation District, farmed in Rogers Cove his whole life. 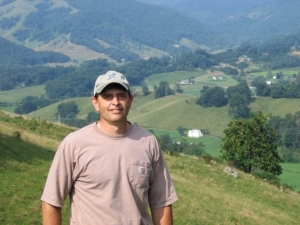 Edwin and his son Mark worked closely together to keep the farm in excellent condition by installing stream-side fencing and water tanks and using rotational grazing practices. Terry Rogers also installed best management practices on his farm to protect water quality of streams in the Pigeon River watershed. 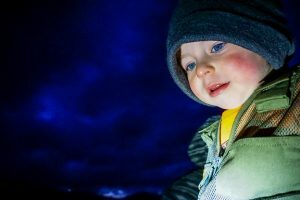 The Pigeon River Fund, a grant program administered by The Community Foundation of Western North Carolina, provided support for this project. Terry — who has been president of the Haywood County Farm Bureau, Treasurer of the Haywood County Cattlemen’s Association, and president of the WNC Beef Cattle Commission — has also farmed in Rogers Cove his whole life. Terry inherited the property from his parents Cassius McCracken Rogers and Pauline Noland Rogers who worked the land all their lives. His mother was the granddaughter of famed community doctor and banker Rachel Eleanor Ferguson Noland, a pioneering woman who traded livestock, farmed, and worked in her loomhouse to make a living for her family. Eleanor served as a community doctor, taking her little black satchel with her when neighbors asked her to come and “doctor” their sick. She also served as a community banker, loaning money out to neighbors so they could buy a farm, build a house, or pay their bills, collecting a little interest in return. Most of these folks had no collateral, so could not qualify for a formal loan from an established bank. Eleanor enabled many families to have their own home. The Rogers Cove land in Crabtree Community was originally purchased by family ancestor John H. Rogers almost 200 years ago. Son of Revolutionary War soldier and pioneer Hugh Rogers and Nancy Thornton Rogers of Fines Creek, John married Mary “Polly” McCracken of Upper Crabtree. He purchased property which became known as Rogers Cove in the Crabtree area, and the land was later passed on to various descendants. We are grateful to all of SAHC’s members, the Rogers family, The Pigeon River Fund, Brad and Shelli Stanback, and the NC Department of Agriculture’s Agricultural Development and Farmland Preservation Trust Fund for protecting this historically important, thriving farm. Thank you! “There were three basic things which prompted our family to preserve this farm land. 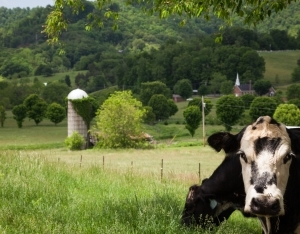 Foremost, the belief that protecting farmland is important for future generations. Also there is the sentimental factor for protecting property that has been in the family for a long time. And last, just the aesthetics’ of farm land vs. a subdivision. This land today is a summation of all of what my ancestors have invested into it over the past 4+ generations. I think of the clearing of the timber to make areas to seed into hay fields and pastures for their livestock. You try to understand how that supported their milk cows and horses, which in turn supported their existence. Also the hard work with axes, cross cut saws, horses, etc. — “the good, hard old days”. This land is still used as it was with my early ancestors and I would hate to see that change to another use that would not complement and build on what’s already gone into it. I am also sensitive to farmland reduction in the past 100 yrs and how that can effect food sustainability. When I came along, horses were still used for light work like cultivating tobacco but tractors had taken over the heavy work like plowing the corn land. I remember the talk about how you had to feed a work horse “a plenty” if you expected it to plow all day. Thus a lot of the corn grown was used back as feed fuel for the work horses. Conservation of energy makes sense considering it takes the same amount of corn energy as diesel energy to plow a furrow. I think of how hard it was to plow up and rotate crops every other year with legumes to get nitrogen into the soil because there was no petroleum based fertilizer. So if there continues to be less acreage and petroleum (being a finite resource for plant food); farmland will only continue to be more important in the future. I truly relished the lifestyle offered by growing up on a farm and having relatives and good neighbors all around. As children we were free to roam without any concerns of safety. When I was 4 yrs old I remember deciding to run away from home — for no apparent reason. It was a sunny winter morning where the overnight frost was just melting as I trudged through the woods to the ridgeline between our house and my grandparents. I walked down to a barn where my uncle was sacking up silage and when I told him I was running away he did not even look up but told me to go by and say goodbye to my grandmother before I left. So when I walked up to her house and told her, all she said was to have a sausage biscuit before I left. Somehow, I forgot that I was running away. Also I watch as adjacent farms are sold and developed. I see how the dynamics of “community” of the people change with it. Site visit in Rogers Cove (L to R): Alison Davidson (Pigeon River Fund committee member), Laura Rogers (Landowner), Jess Laggis (SAHC), Tara Scholtz (CFWNC), and Dyatt Smathers (Pigeon River Fund committee member). 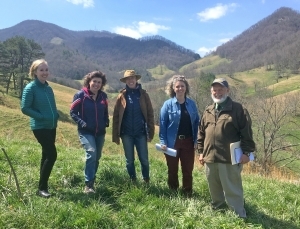 “One focus of the Pigeon River Watershed Plan is reducing development density on steep mountain slopes,” says Tara Scholtz, Senior Program Officer with The Community Foundation of Western North Carolina (CFWNC). In northwest Madison County, 541 secluded acres of forest filter miles of clean mountain streams that once provided drinking water to town residents. We worked with the Town of Marshall to permanently protect the Marshall Watershed property with a conservation easement — our sixth project to conserve municipal watershed lands. The Clean Water Management Trust Fund awarded SAHC a grant to protect this tract and its outstanding water resources. 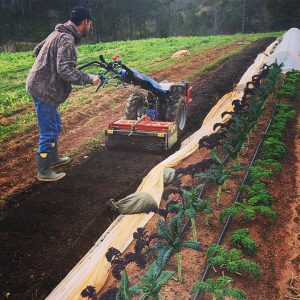 Our Community Farm continues to serve as a model — balancing agricultural production with environmental responsibility while providing educational opportunities. 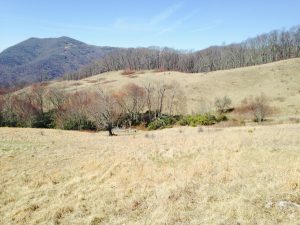 We purchased 149 acres at North Turkey Creek in Buncombe County, adding to a contiguous block of protected lands in the Sandy Mush community. The acquisition protects wildlife corridors and headwater streams that flow into North Turkey Creek in the French Broad River watershed. 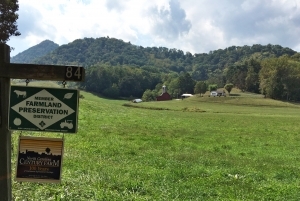 We purchased 146 acres at Flatwoods Pastures in the Crabtree Community of Haywood County, protecting significant acreage for continued grazing. 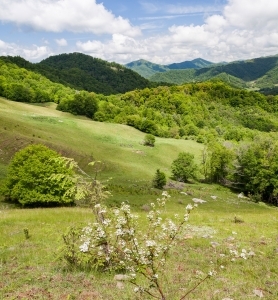 The high elevation tract combines productive agricultural land with valuable wildlife habitat and breathtaking scenic views. It connects with our Garret Cove property in Sandy Mush and the recently purchased Little Creek Headwaters tract, a beautiful forested cove in Bald Creek Valley. Project POWER is a local division of the national AmeriCorps program. Members of Project POWER work exclusively in Buncombe Country and with at-risk youth in schools, non-profits and faith biased organizations. 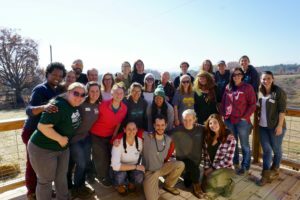 SAHC and Project POWER have been fostering a relationship to connect people with the environment and outdoor experiences on conservation properties. 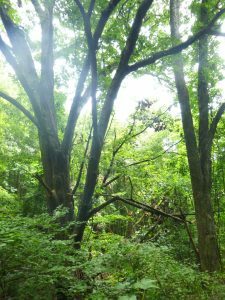 146-acre Little Creek Headwaters Property — Protected! 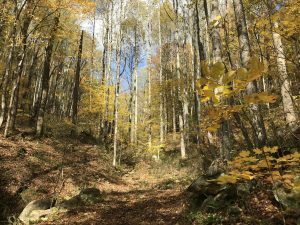 Today we purchased 146 acres in Bald Creek Valley in the Crabtree Community of Haywood County — a beautiful, forested cove with streams running through it, now conserved for future generations. https://appalachian.org/wp-content/uploads/2016/11/Photo-9.jpg 2048 1536 sahcadmin /wp-content/uploads/2016/03/southern-appalachian-highlands-conservancy.png sahcadmin2016-11-23 22:01:312016-11-28 22:04:27146-acre Little Creek Headwaters Property — Protected! This month, twelve 7th grade boys from the French Broad River Academy (FBRA) volunteered at our Community Farm. We are grateful for assistance from these positive, hard-working students! Service learning is a vital piece of the FBRA curriculum, and they partner with us several times a year to help out with various projects at the Community Farm.